Venezuelan opposition leaders are fearing a crackdown and increased repression following a bizarre, alleged assassination attempt against the country’s strongman president, Nicolas Maduro on Saturday night in Caracas. There was some kind of explosion while Maduro was giving a speech to a crowd of soldiers. 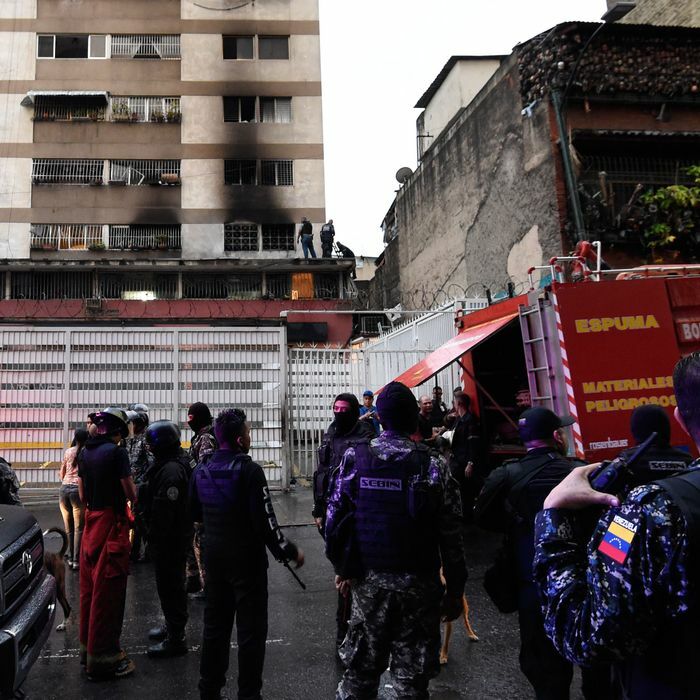 According to the Venezuelan government, the would-be assassins used two explosive-equipped drones in their attack, and the attack injured seven soldiers but didn’t harm Maduro. Firefighters at the scene, however, told the Associated Press that the culprit was a gas tank explosion in a neighboring apartment building. In addition, at least one Trump administration official has already suggested that the attack was staged. In footage of the incident, an explosion is heard off screen, causing Maduro and others on the event stage to look up, confused. Bodyguards then rush to shield Maduro, and another video angle shows soldiers fleeing the scene in a panic. No videos have come out that show the drones or the explosion itself. Meanwhile, an obscure four-year-old Venezuelan group calling itself the “National Movement of Soldiers in T-shirts” has claimed responsibility for the blast, explaining that their two drones were shot down by government snipers. The group has said that its goal is to unite Venezuela’s resistance groups, and they released a statement late Saturday in which they decried the state of the country under Maduro. The incident comes less than three months after the socialist strongman won a second presidential term in an election marred by accusations of fraud. Under Maduro — who has been in power since the 2013 death of his predecessor, Hugo Chavez — Venezuela has been in a near constant state of crisis. The country’s economy has largely collapsed, its currency has suffered hyperinflation, and its population has endured widespread food and medicine shortages, as well as increased crime and violence. Hundreds of thousands of Venezuelans have left the country over this time, and last year, 125 people were killed across four months of clashes between Venezuelan authorities and anti-regime protesters. The military has continued to support Maduro, however, and the country’s defense minister vowed the their unconditional loyalty to Maduro again following Saturday’s events. One expert on the country, David Smilde, told the AP that he didn’t think the attack was staged, but that the footage of the incident probably embarrassed Maduro and made him look weak. He expects the incident to prompt a purge of disloyal officials by the regime, as well as further restrictions on Venezuelans’ civil liberties.